When it comes to making your home smarter and more efficient, one of the easiest and most effective steps you can take is installing a smart wifi-enabled thermostat. There are so many smart thermostats available today. It can be difficult to decide which one is the best for your home. One of the more recent additions to the smart thermostat market is the Aprilaire Model 8920W WiFi Thermostat with Indoor Air Quality Control. Aprilaire is a relative newcomer to smart thermostats. They have a very well-established reputation for quality in the HVAC business, though. Let’s take a look at how the Aprilaire WiFi Thermostat compares to two of the most popular names in smart thermostats. These are the Ecobee4 and the Nest Learning Thermostat. The Aprilaire, Ecobee, and Nest all offer the primary advantage of a smart thermostat. This is the ability to automatically adjust the thermostat temperature setting throughout the day. This is in order to maximize energy savings without sacrificing comfort. However, the way that these thermostats accomplish that goal varies. Both Ecobee and Aprilaire rely on the tried and true method of homeowner programming. In other words, you program the thermostat with particular temperature settings for different day and times. Once you’ve put those programs in, you can easily switch between them when your schedule varies. The Nest Learning Thermostat, on the other hand, “learns” your regular schedule over the course of the first few weeks after installation. That means you have to remember to adjust the temperature manually every day as you leave for work, go to bed, etc. so that the Nest can essentially program itself. While this saves you from having to do the programming, it does mean that you have to remember to manually set-back your thermostat for those first few weeks until the Nest learns your schedule. It also means that if your schedule varies for some reason, the Nest can’t be as easily switched to a different program. Another advantage that the Aprilaire thermostat has for people with varying schedules is the pre-programmed Away and Vacation modes. You can use these to quickly and automatically override your programmed schedule to maximize energy savings. Temperature isn’t the only factor that determines the comfort of your home. Humidity, ventilation, and air cleaning also play important roles. The Aprilaire, Ecobee, and Nest thermostats are all able to monitor the humidity level in your home. If you have a whole-home humidifier or dehumidifier, all three of these thermostats can be connected to that system and control it along with your heating and cooling. However, when it comes to ventilation and air cleaning, that’s a different story. Do you have an Energy Recovery Ventilation (ERV) system or a whole-home air purifier? You’ll want to choose your smart thermostat with those in mind. That’s because the Nest thermostat is not compatible with ventilation systems or air purifiers. Meanwhile, the Ecobee4 can handle ventilation systems, but it also is not compatible with air purifiers. The only one of these smart thermostats that can handle all three kinds of indoor air quality products is the Aprilaire. In fact, Aprilaire makes some of the best IAQ products available, and their smart thermostat is specifically designed to integrate those products into one seamless system. In fact, if you have an Aprilaire whole-home air purifier, you’ll need the Aprilaire WiFi Thermostat in order to get full use of certain features such as Event-Based Air Cleaning. The Aprilaire, Nest, and Ecobee all have easy-to-use touchscreens. With this you can monitor and adjust settings. However, one big difference is the size. 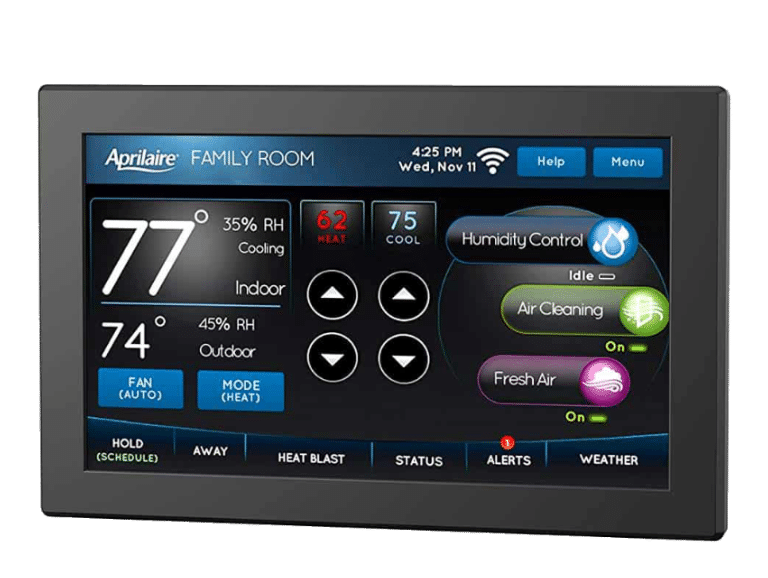 While the Nest and Ecobee touchscreens are only 2-3.5 inches in diameter, the Aprilaire has a 7-inch diagonal touchscreen. This makes the Aprilaire touchscreen easier to read and able to show more information. If you want to do most of your adjusting and monitoring directly on the thermostat, that larger screen can definitely be helpful. And thanks to this bigger screen, the Aprilaire can display more information. This can be the local weather and pollen forecasts. It can also show your home’s inside temperature and humidity. The Nest, Ecobee, and Aprilaire smart thermostats all offer one major advantage. You can control them from anywhere thanks to their wifi capability and mobile apps. Just like with the Ecobee and Nest, you can download an app to monitor and adjust your Aprilaire thermostat from your smartphone. Additionally, the Aprilaire thermostat is compatible with Google Home and Amazon Alexa, just like the Nest. The Ecobee has Alexa built in, but it can also be connected to Google Home. Do you have a zoned system in your home? You’ll be glad to know that all three of these thermostats are compatible with most zoned systems. The Aprilaire Model 8920W WiFi Thermostat with Indoor Air Quality Control may be a newcomer to the smart thermostat market, but it’s making a big splash. The Aprilaire has all the same great features of the Ecobee and Nest, like programmability, mobile apps, and smart home integration. But the Aprilaire takes its game to the next level. This is with the seamless integration of indoor air quality products like ventilators and whole-home air purifiers. With the Aprilaire WiFi Thermostat, you can control every aspect of your home’s comfort—and save energy too!